Rick Sammon is clearly a talented photographer, as evidenced by a liberal sprinkling of his work throughout this Photo Workshop DVD. He also is an energetic and talented communicator and teacher, qualities that most photographers, regardless of their picture making talent, often lack. 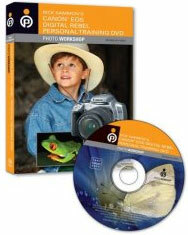 The Canon EOS Digital Rebel Personal Training DVD seems to be aimed at first-time DSLR owners, and Rick certainly has far more than a few things to teach them. Much of the material is pretty universal, but the DVD is specifically aimed at owners of Canon’s Rebel XTi. As this is a best-selling entry-level camera at the moment, I suppose that it doesn’t limit the market for this instructional DVD too much, though owners of other DSLRs would benefit from most of the same material. This is definitely an upbeat video with a lot of good information for a beginning photographer. Despite Rick Sammon’s talent and upbeat presentation, I found the format of the Canon EOS Digital Rebel Personal Training DVD to be somewhat annoying. The story line is Rick teaching an underling how to use her new Canon Rebel XTi. They travel to interesting locations such as Universal Studios in Orlando, Madam Tussaud’s Wax Museum in New York City, and The Alligator Farm in St. Augustine. Fair enough, and seems to fulfill the promise of the instruction being like a one-on-one workshop. However, I found the format of the tutorial as a whole to be somewhat tedious. Unfortunately, the Canon EOS Digital Rebel Personal Training DVD is chopped into many short lessons followed by a slow-moving review of each tiny lesson in slideshow format. Most annoyingly, there seems to be no easy way to skip the pedantic review sections and often they seem longer than the more interesting lessons that they are a review of. For example, a brief lesson on how to hold a camera seems explicit enough without the need for a Keynote followup. If you have EVER used iPhoto, you are probably overly familiar with Acoustic Sunrise, selection #1 of the sample music for iPhoto slideshows. Now imagine having to hear it over-and-over as accompaniment to the many inescapable, short, and often redundant review sections. Drives you batty, and the only excuse I can see for it is avoidance of having to pay royalties for less shopworn music. I would have preferred even rank amateur attempts at using loops in Garageband to create background music. Furthermore, you can’t just kick back and enjoy the DVD, as you must constantly click a button to get to choose another lesson (AFTER listening to the fingernails-on-blackboard soundtrack of the review section). It would be far easier to turn a page if this were a book, and I would think that many who purchase an instructional DVD are expecting a more fluid experience and aren’t expecting this degree of required semi-active involvement. I suppose that this is what remotes are made for, though I was watching it on a computer that, due to age and equipment limitations, was sans Front Row so I had no choice but to stay alert and use a mouse. Maybe I’m just getting old and cranky. Many of the short lessons seemed to cover simple things in detail while more complex operations seemed to be glossed over. For example, the lesson on Workflow went rather swiftly from Turn on camera, Take Pictures, Remove memory card, then on to Make a 13 X 19 in. glossy print (with extra credit hint: be sure to use Canon paper in a Canon printer). Though it wasn’t mentioned, I noticed that Sammon uses Macs for processing his photos, reinforcing my suspicion that he’s a pretty smart guy, so maybe there just were time limitations that didn’t permit a little more detail to be given in the video. I have the feeling that Rick doesn’t always practice what he preaches in the Canon EOS Digital Rebel Personal Training DVD. I spotted ISO 800 being used in bright outdoor locations. Likely explanation: it looks like more fun to be waving a camera around than tethering it to a tripod, image quality be damned. In this sequence the “student” was using a big bazooka zoom lens and I have a feeling that a tripod would have been of benefit. I suppose a tripod would be a real killjoy and I don’t remember seeing one in use throughout the tutorial except for the lesson on sunrises and sunsets. OK, enough, I’m getting picky! For beginning photographers, there is plenty of good information in this tutorial if they persevere, and many excellent photos taken by Sammon to serve as inspiration. However, they might have to pick up a few additional skills that were glossed over in the video to achieve the same kind of results. In addition to the Canon EOS Digital Rebel Personal Training DVD, Wiley also publishes excellent tutorial BOOKS that might serve the interests of beginning photographers better unless they just insist on getting instruction from their TV screen and are handy with a remote control.